Oct. 3, 2012, 9:57 a.m.
By Andrew Phelps Oct. 3, 2012, 9:57 a.m. Meanwhile, the Knight Foundation put its money and might behind maps owned by no corporation: OpenStreetMap. Like Wikipedia, OpenStreetMap is a map that anyone can edit. The data comes from volunteers who use GPS devices or just local knowledge to map their environments. If you want to fix a mistake, just hit the ubiquitous “Edit” button. The site’s existing user interface is clunky and unfriendly, however. Knight awarded a $575,000 News Challenge grant to OSM developer MapBox to refine that user interface and develop new APIs to make the data easily exportable. “What’s critical about OpenStreetMap is not the map. It’s the data,” said MapBox CEO Eric Gundersen at the ONA conference in San Francisco. The map you see at openstreetmap.org is purposely ugly, a visual wrapper around the wealth of data underneath. “The power of OpenStreetMap is the power of grabbing that data out and doing stuff with it,” he said. MapBox, a for-profit company, has built very pretty maps with OSM data. The company’s highly customizable mapping platform is used by The New York Times, NPR, The Boston Globe, and Foursquare. Gundersen had me visit the site, create an account, and look up my old San Diego address. He watched as I worked. I saw that the street name was listed incorrectly, so I went to fix it. The Flash-based interface was pretty rough, but I figured it out. It was gratifying to correct a detail I knew to be wrong; you can’t do that on an iPhone. People like Gundersen believe data is better if anyone can contribute — and everyone owns it. The Knight Foundation has previously funded mapping projects focused on the end user, such as Stamen Maps and TileMill. In this case, Knight is drilling beneath the presentation layer and investing in the data underneath — fitting for the data round of the Knight News Challenge. “The big part of the investment is making it easier to get data out, so it’s more consumable,” Gundersen said. He wants to see news organizations ordinary users creating their own projects with OSM data. MapBox will create more intuitive, low-level APIs to help introduce new developers to the community. Gundersen said he expects the bulk of the new OpenStreetMap tools to be launched in spring 2013. All of the code will be open-sourced and posted to GitHub. POSTED Oct. 3, 2012, 9:57 a.m.
Phelps, Andrew. 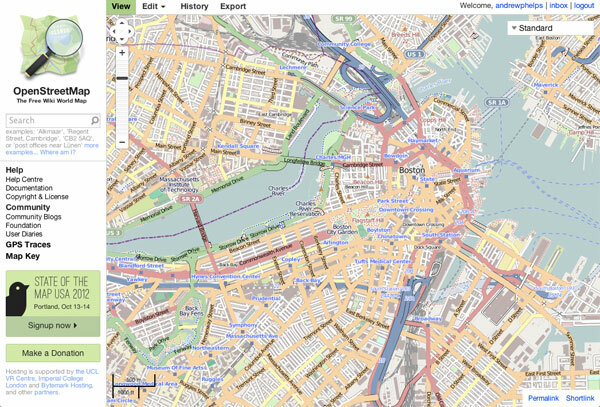 "While Apple and Google bicker, Knight invests in open maps." Nieman Journalism Lab. Nieman Foundation for Journalism at Harvard, 3 Oct. 2012. Web. 22 Apr. 2019. Phelps, Andrew. "While Apple and Google bicker, Knight invests in open maps." Nieman Journalism Lab. Last modified October 3, 2012. Accessed April 22, 2019. https://www.niemanlab.org/2012/10/while-apple-and-google-bicker-knight-invests-in-open-maps/.